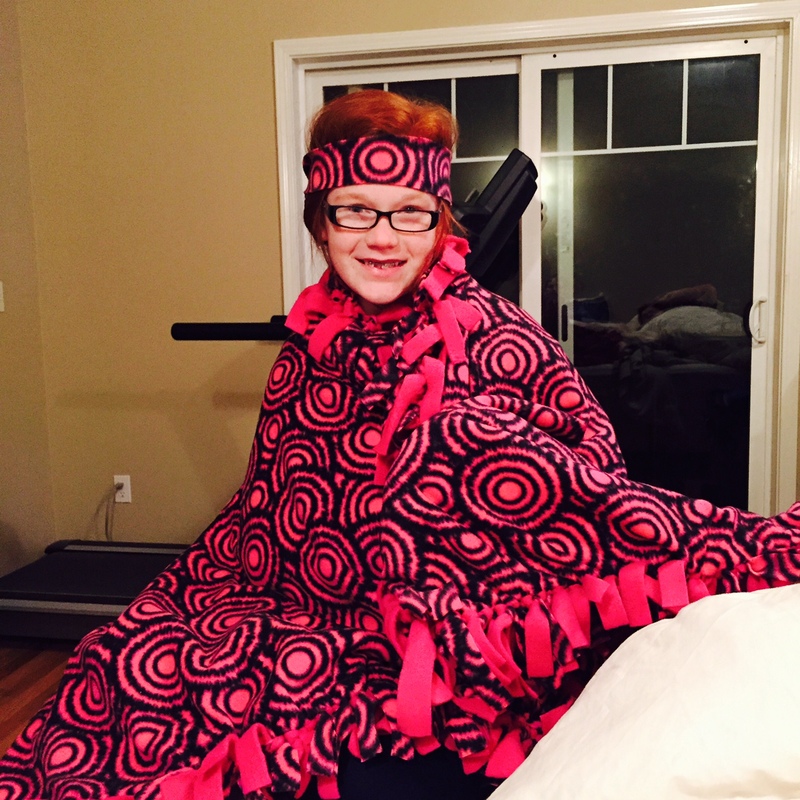 Patsy has been wanting to make a tied fleece blanket in the same way that Michaela, her cousin, made her pillow. I did not have time last week when the cousins were here to help her, and she was feeling left out, so we got busy last evening. We used about 2-1/4 yards to make hers, but the amount can be larger or smaller. Ours was determined by the amount of solid pink I had in my stash. 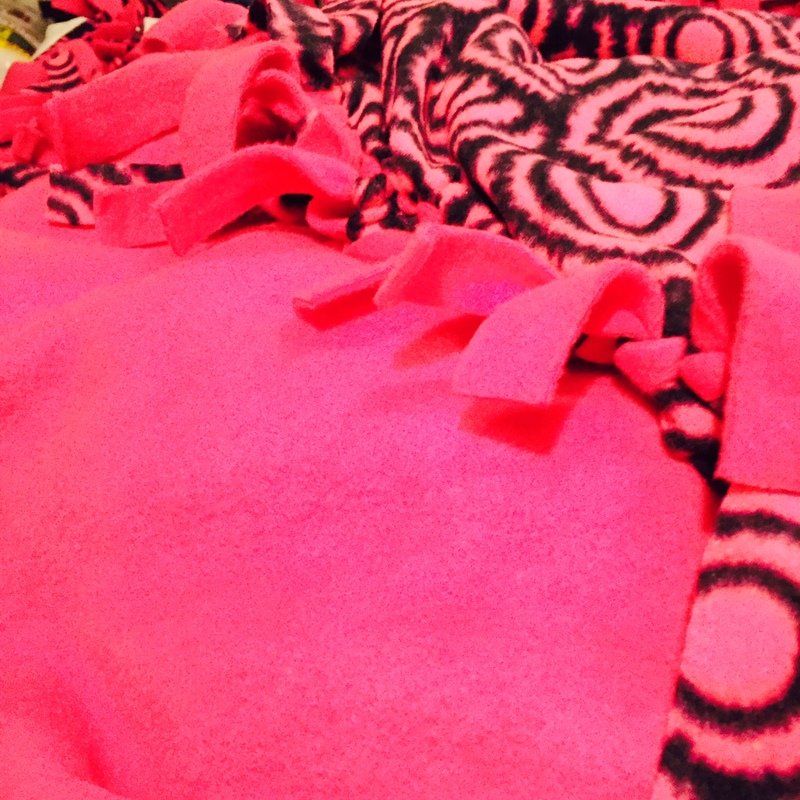 She bought the swirled fabric a while back and we paired it with the pink I already had. We laid the pink on top of the swirled and I cut it off evenly. Then, I helped her cut out 6″ squares from the corners and cut 1″ x 6″ strips all the way around, cutting through both layers. Some were a little crooked, wobbly, not quite the same as the others, but it doesn’t matter in the end. It turned out great! We both cut and cut until we were done. Then, she sat down on the floor in front of the t.v. and tied the strips together while she watched a movie. She got it done last evening and immediately wrapped it around herself and wanted me to take a picture. This would be a great last-minute Christmas or birthday gift for someone. Fleece often comes on sale at JoAnn’s for a good price, and that’s when I stock up. Patsy’s looking pretty cute with that headband on! Great job on the blanket too. It looks like the perfect blanket for curling up with a good book when the weather is too cold to do anything else. Yeah, I have to laugh about the headbands out of scraps. The cousins started it last week, and I guess she liked the idea as well. It got down to 23 degrees F, here, and we are whining. I know it’s much colder elsewhere, but we are used to very moderate temperatures here in our part of the Pacific Northwest, due to our proximity to the Pacific Ocean (even though we are 2 hours away from it).